Flu season is officially here! The geographic distribution of confirmed flu cases has been steadily increasing week over week – 6 US states are reporting regional distribution this week, which doubled from last week. The unfortunate truth is that it’s not possible to predict what this flu season will be like. While the flu spreads every year, the timing, severity, and length of the season is unpredictable. Generally, seasonal flu activity occurs between October and May with it peaking in North America between December and February. In my neck of the woods (Ontario, Canada) we see our biggest peak during the week of Christmas....not the type of present most of us are dreaming of! As we’ve done a number of blogs on influenza, I’m not going to repeat signs, symptoms or hints to keeping you healthy. 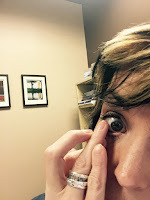 However, after reading an interesting summary of a survey conducted by the CDC highlighting the fact that almost all of the 41 million estimated contact lens wearers in the United States are engaging in at least one behavior known to increase their risk of eye infections, I thought it would be the perfect reminder of how cold and flu viruses are spread. The survey concluded that more than 99% of survey respondents reported at least one risky behavior such as; keeping their contact lens cases for longer than recommended (82%); “Topping off” solution in the case—adding new solution to the existing solution instead of emptying the case out fully before adding new solution (55%); or wearing their lenses while sleeping (50%). So let’s talk about risky behavior. Topping off with any form of disinfectant is a BAD idea. You need the right concentration to kill bugs. I’m surprised they didn’t ask the question to find out if people perform hand hygiene before putting in, taking out or adjusting contacts. If we are going to talk about risky business, that is definitely one of them! Most cough, cold and flu viruses are believed to be passed from person to person by contact with respiratory droplets through direct bodily contact (such as kissing) or touching something with virus on it (such as shaking hands with someone who has the flu) and then touching your mouth, nose or eyes. Combine this with the fact there is a plethora of scientific evidence that people touch their faces an average of 3.6 times per hour, and common objects an average of 3.3 times per hour means that germs get on our hands much more frequently than we wash them off! Being a person who used to wear contacts, I know that I had a horrible rate of self-touching - in fact I stopped wearing contacts due to dry eyes which lead to my constantly rubbing or touching them with my fingers which eventually lead to getting an ulcer. As peak flu season is only 6 weeks away, I hope you’ll start thinking about where your fingers have been - and if you wear contacts ensure that you wash your hands before you touch your eyes to avoid your risk of getting the flu!